If you just want to bolt up and ride without messing with zip-tie's or fabricated mounts, then the 26" Motorized Bicycle Frame with fuel tank is the frame you've been looking for. Ditch that old, clunky tank- this frame's got a 3.75L gas tank built right in to it with an easy-to-use twist gas cap. The frame also cleans up your cables with cable ports running along the center and bottom of the bike, eliminating the need for ugly zip-tie's that can scratch your paint job. It's also disc-brake and center-pull brake ready with mounting ports for each style on the rear end of the frame. 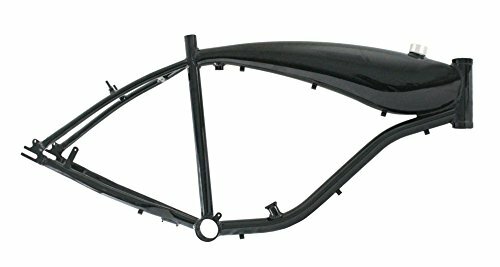 With a front motor mount that can adapt to nearly any bike engine around, the 26" Motorized Bicycle Frame is a lightweight, high quality bike frame just waiting for your next build! If you have any questions about this product by Kobe, contact us by completing and submitting the form below. If you are looking for a specif part number, please include it with your message.